Don't thank me, I just found it. Outstanding quality, probably the highest quality live recording I've ever heard. It's a big file but well worth it, features A Road Song, Cold Comfort Flowers, Cemetery Guns too! Oh, yeah, my dad found it on there a couple days after the show and burned it on a CD for me. I think I was gonna tell people about it, then forgot. I've got them at Toad's Place, Connecticut in '97 in high quality (well, it sounds high to me). Maybe not as good as the one in San Francisco. I tried putting it on MegaUpload, but it's been over 4 hours and nothing's happened yet. What do you think I should do? Well there are other file sharing sites out there, try Mediafire or Rapidshare. It might be taking so long because of how big the recording file is. If it is a FLAC file then it will probably be a few hundred MB, it might be best to convert it to a 320kbps MP3 and then upload that file if it is very slow. My dad said it's the part toward the end of "My Sharona" by The Knack. 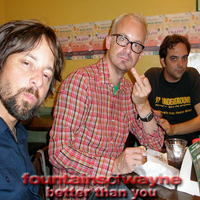 I didn't see it on the songlist (on fountainsofwayne.us), so I'm not really sure. I just tried to download these files but its been a long time since someone accessed it. Anychance someone would re-post? Yeah, I'll try to remember to put it back up when I get home this weekend. Thanks, that would be Awesome!!!! Is this still available anywhere? This link is broken now too. Alright. I'll get to that when I can. K, I put it back. Hopefully it works. Wow, thanks for the fast response. New link is working great. Thanks again!